Luke Bigginton’s first goal of the season was enough to earn Deal victory in this latest “Battle of the Hoops” at Corinthian on Saturday. “Biggy” struck after just nine minutes, finishing off an Andy Miller free-kick at the far post, and Deal then produced a resolute defensive performance to ensure that one goal was enough to claim all three points against opponents who are also nicknamed the “Hoops”. With both teams still in with a chance of finishing in the top five this was a game full of commitment and Deal manager Derek Hares will have been particularly pleased with the “clean sheet” after his side had conceded three goals in each of their previous three matches. 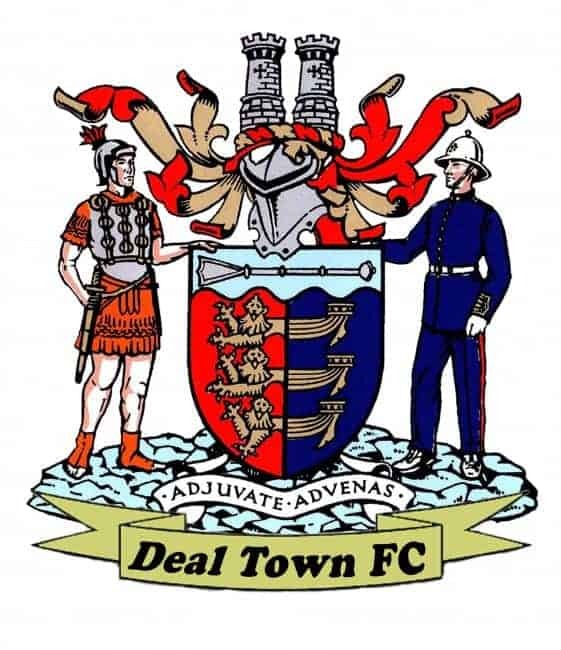 Deal remained on top after Bigginton’s early breakthrough and six minutes later Jack Paxman was denied a second Deal goal by an excellent save by Aiden Prall in the Corinthian goal. Prall then conceded a penalty on 38 minutes, when he was adjudged to have tripped Paxman, but Deal missed from the “spot” for the second match in a row when the Corinthian ‘keeper saved Charlie Walsh’s shot. The home side’s best first half effort came on 27 minutes when Deal ‘keeper James Tonkin denied Oscar Housego from close range, and then in the second half Corinthian striker Michael Hurcomb missed a glorious opportunity when he scuffed his shot wide from five yards. Deal then held on to record their sixth away league win of the season and also “leapfrog” their opponents into eighth place in the table.